Worry stones are also known as Palm Stones, These stones are oval in shape and are used to remove diseases and dirty energies from the physical body. It can be done by rubbing the thumb or the palm with both palms. Hollow is made in the oval or round shape stone to enable the thumb to be rubbed with the stone.Some worry stones also have a flat base.This worry stone or the Palm stone absorb the worries and negative energy of a person. Pressing the thumb against the stone produces hormones to calm the emotions. 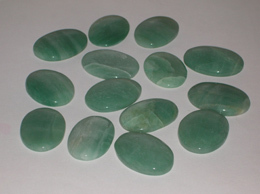 Worry stones are convenient to be kept in the pocket and are good companions for the guidance. These stones are also good to hold during meditation. It is good to gift to be remembered and cherished. Worry stones are also known as Palm Stones, These stones are oval in shape and are used to remove diseases and dirty energies from the physical body. Each natural stone is different from the other as it has different healing properties. Find in this section different worry stones/ palm stones like Amethyst, Rose Quartz, Quartz Crystal, Tiger Eye, Agate, Lapis lazuli, Sodalite, Howlite, Green Aventurine, Carnelian and more.